If you’re planning a trip to Japan during the summer months, consider attending a few festivals while you’re here. Japan is full of summertime festivals, from local fireworks celebrations to the internationally renowned Gion Matsuri in Kyoto, and they can be a great way to experience Japanese culture at it’s most jubilant. For locals and visitors alike, festivals are a great time to don traditional Japanese summer clothing like yukata and jinbei. These lightweight, comfortable clothes are perfect for watching parades and eating shaved ice. They are also an excellent souvenir as they are authentic, affordable, and easy to come by. Many visitors to Japan may be familiar with yukata as the cheap, thin, robes loaned out to guests by many hotels and onsens (traditional Japanese spas). These yukata are loose, comfortable, and not really worn out in public. They are, after all, designed to be worn after having just come out of the bath. Think of them as not dissimilar to a bathrobe or dressing gown. Publicly worn yukata for men tend to be thicker, often of a lightweight cotton (sometimes with linen panels) and dyed in darker colors like navy blue or dark brown. Both pictorial (cranes, waves, kanji) and abstract (geometric) designs can be dyed, embroidered, or woven into the fabric of the yukata. Women’s yukata are generally as bright as men’s are dark and are usually paired with a soft under-robe. Patterns and designs include flowers, birds, scenery (like mountain views) and also very modern images like Hello Kitty or Disney characters. Pale blue, pink, yellow, and green are very popular as base colors, but darker hues contrasted with bright designed are not uncommon. For both men and women, one complicating factor is the obi, or sash. A traditional, proper, obi is several meters long and is meant to be wound around the body several times before being tied off in an elaborate knot. Without training, these can be very difficult to both put, and keep, on. You may want to consider a false obi (think clip-on tie vs. necktie) which mimics the look of the traditional obi, but only requires the ability to tie a bow to apply. Jinbei are the younger, more casual siblings of yukata. Often made from the same materials as yukata, the major change is in the pattern of the cut. Jinbei look like a matching jacket and shorts set. Traditionally a male garment, recent years have seen jinbei made and marketed towards young women using the same bright colors and light fabrics of women’s yukata. Jinbei are significantly easier to wear, usually utilizing a simple elastic band or drawstring to keep the shorts in place and eschewing any sort of belt in favour of interior and exterior ties to keep it closed. The sleeves are shorter and tighter (although still very loose) than a yukata. 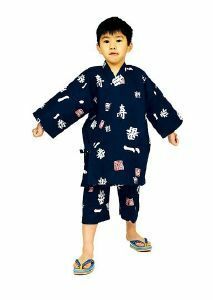 Airflow is aided by a loosely woven seam between the shoulder and torso panels making jinbei somewhat cooler than yukata. Traditionally, yukata and jinbei were worn with split-toed socks called tabi and geta, a wide, tall wooden sandal. While these are still popular, sandals or flip flops are just as common. Unlike yukata and jinbei, buying tabi and geta in Western sizes can be problematic and might be better purchased online as stores rarely stock anything above 28 cm. Along with footwear, you’ll need somewhere to keep your wallet and cellphone as neither yukata nor jinbei have pockets. For this, kinchaku, simple drawstring bags, are very popular with both men and women. Many yukata sets come with a matching kinchaku, but they can be purchased separately very easily. Lastly, a folding fan, called a sensu, is a must-have accessory for festival going. Summer in Japan is hot and humid and crowded. A sensu can be a surprisingly welcome addition to one’s ensemble. Like suits, yukata (and to a lesser extent jinbei) can be purchased off-the-rack, vintage, or bespoke. Off-the-rack is the easiest to find as most department stores will carry a selection during July and August in both the men’s and women’s departments. However, these tend to be one-size-fits-all and of lesser quality fabric-wise. On the other hand, they are usually the cheapest option, coming it at between ¥4,000 to ¥10,000. Moving up in price and quality is the vintage option. Many department stores that cater to younger people have vintage shops with a nice selection of high-quality, low-price clothes and accessories. This is a great way to see what styles and colors are best for you without having to worry about overly-aggressive sales staff. Vintage clothes are usually between the ¥10,000 and ¥20,000 marks, although that price can vary wildly depending on prevailing fashions and the location of the store. Bespoke clothing is something of a rarity in Japan these days but custom yukata and jinbei are well-worth seeking out. A hand-sewn, fitted yukata with a full compliment of accessories will be a bit more expensive than off the rack; a nice yukata set can easily run from ¥20,000 to ¥40,000. While many department store based yukata shops can do tailoring, a stand alone tailor’s shop may be a bit harder to find and require consulting your local directory. While most major department stores will have a shop for yukata with knowledgeable staff who can help in purchasing decisions, a tailor can assist with choosing fabrics, styles, patterns, and wearing. The key point with both tailoring and custom purchases is that they take time. In May and June, most shops will be able to take walk-in appointments for fittings and sales. However, once the July and August festival season kicks in, many shops will be too busy to take anyone without an appointment. Relatedly, a woman’s yukata fitting can take two to three hours and time should be budgeted accordingly. Once you have a nice yukata or jinbei, the only thing left to do is get out to as many festivals as possible and enjoy the summer!